There are 1199 posts in this topic. You are on page 21 of 24. Any idea where the setting is to adjust the knocker on/off for the extra ball? The knocker used to fire for an extra ball, now it only fires for a replay. So now my wire release broke on Buzz. Boy this has been a rough week for my NGG. I already have a new wire from Marco. 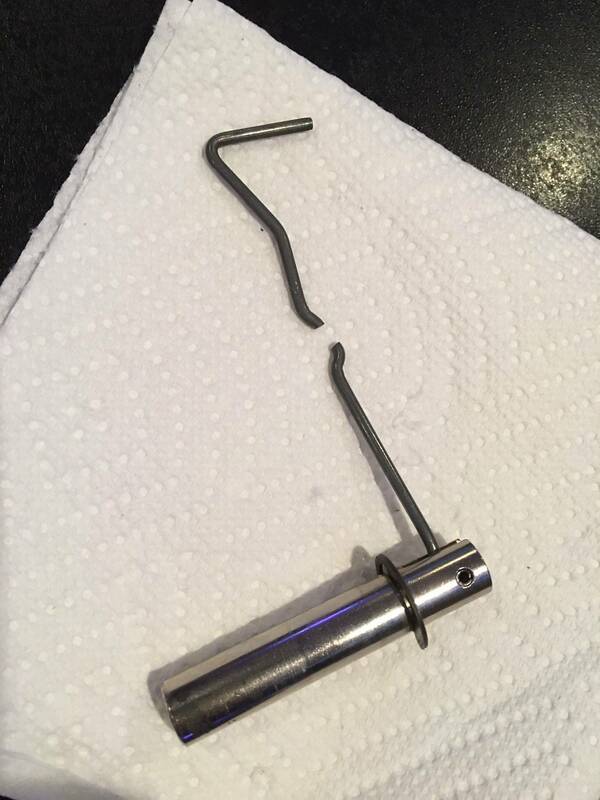 What's the best way to get the old roll pin out? A pin punch set will work. Any hardware store should sell them. Got it fixed up. Took it over to my neighbor who helped me punch out the old roll pin. Took a few disassembles and re-assemblies to get everything back together correctly. Never thought a part like that would just give out, but when I bought NGG a year ago, I went on Marco and bought as many replacement parts as I could and thankfully I had one of these wire forms on hand. Geez, these gofers are a pain to maintain. I've rebuilt both once already, so this was unexpected. Whatever, its fixed now...waiting to see what goes next. 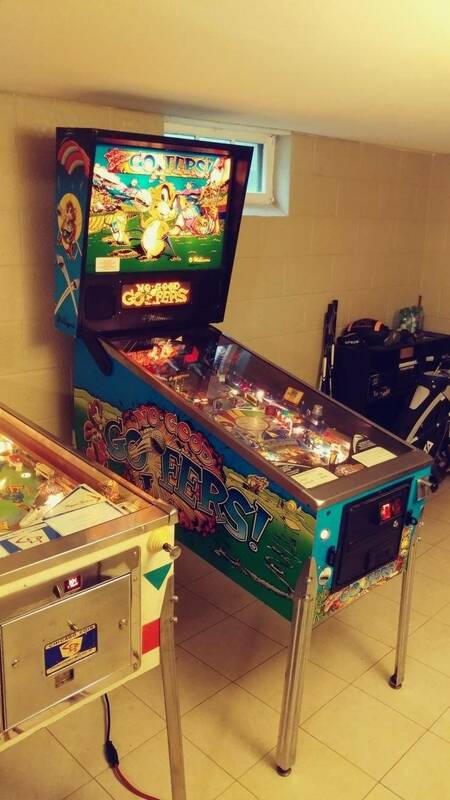 Anyone know what size roll pins are in those gofers? Anyone have a Bud or Buzz figure for sale or where I can get them? 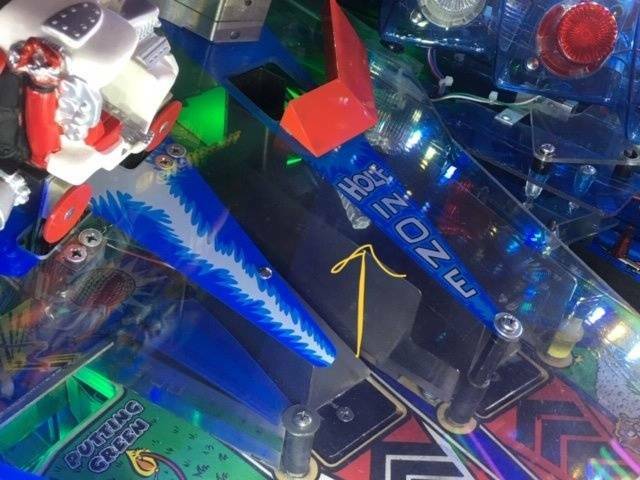 The roll pin is still good. When working on them I tap them so they're barely still in, replace whatver part the hold in, then tap it back in place. Apparently nowhere. This is why this hobby is really getting to the point that I'm ready to give up. If no one is making parts that wear out, the games are useless. Someone should be able to scan and 3D print those two critters can't they? I've been looking for some time with no luck and very close to just attempting a repaint myself. No, you'd have to make a mold to make the gofers. They're a soft rubber type material, because they take such a beating during gameplay. I highly suggest taking them out of the machine and sending them to Modfather for custom repaint. They look great. I think the last set of gofers I bought were from Germany. I'm not sure if they're still in stock, or not. Any maintenance that needs to be done on the wheel? Lube? I run the test in the menu and it lands one off from where it says it should. I don't remember the manual saying anything about lubrication on the wheel. It would probably just attract dirt. There should be a mark on the side of the wheel that should line up with the mark on the sticker. Make sure those are lined up. It's possible someone replaced the sticker and didn't put it on correctly. 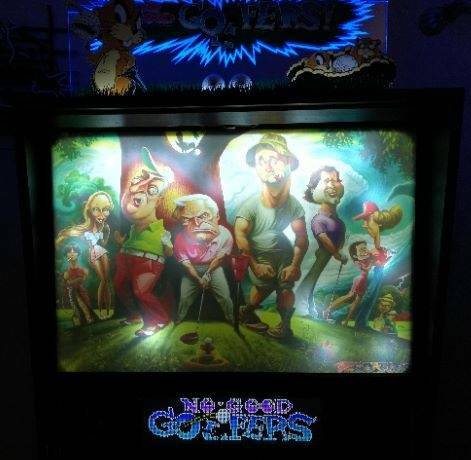 I have an NOS original No Good Gophers backglass. What is something like that worth ? Ask Planetary if they intend to make any. My new Translite is finished. Installed...the translite has LED spots installed. I need to change these out to lower the brightness of the new translite. Otherwise it's pretty nice. This is why this hobby is really getting to the point that I'm ready to give up. If no one is making parts that wear out, the games are useless. 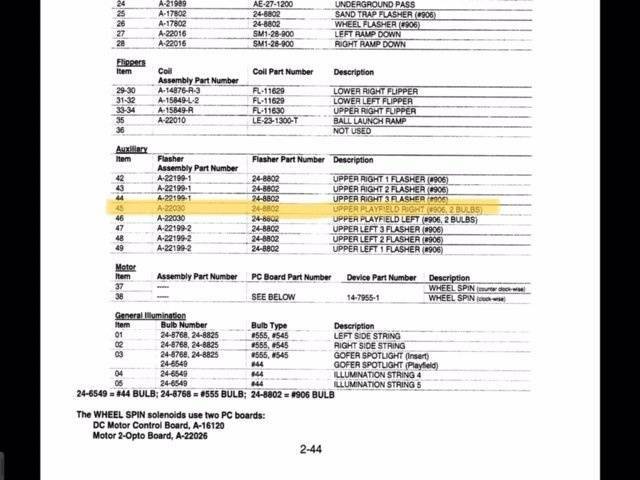 There are way more replacement parts (for out of production machines) available today than at any time in the last 25 years. In the "old days" most of the replacement parts were from operators/collectors that had a squirreled away parts over the years. Almost nobody was remaking parts. So today, most of the parts that need to be remade are either covered by intellectual property rights or are difficult to remake...like Bud and Buzz, which need a mold to be manufactured. 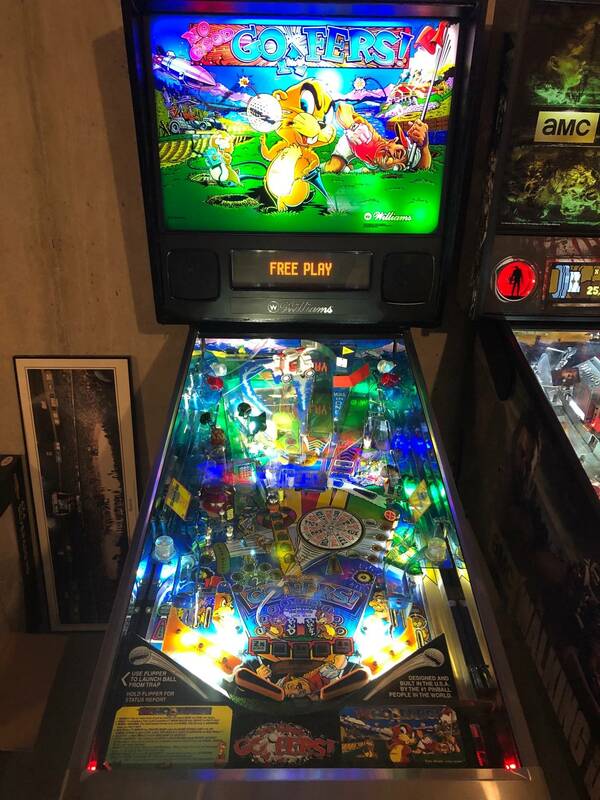 I believe that the consolidation of rights by Planetary Pinball is a great thing, now parts can be remade without issues with getting permission from multiple sources. If course, one owner/supplier leads to bottlenecks and cost benefit analysis on what to make. Say it costs $5000 each to make an injection mold for Bud or Buzz and it costs $5 to mold each one and it costs $10 to finish and paint each one...if you were going to make a small run of say 100 each. So the cost would be 5000/100 + 5 + 10 = $65 each. So the question is, would 100 be enough or too many. if you made 200 each, the cost would then probably be something like $40 each. So the major cost driver is the making of the mold and it's amortized cost. In order to get them at a reasonable sale price of $30 each, you'd probably have to make something like 1000 each. That's a lot of gofers to sell, and your upfront cost would be $5000 + $5000 + $10 x 1000 + $10 x 1000= $30,000. At $10 per unit cost, you'd make $20 each, but you'd have to sell 1000 to get your money back...and then you turn a profit. Assuming that you could make Bud & Buzz without needing any permissions, which in itself if questionable, you have to be able to upfront the costs of making the mold and buying the parts and warehousing them...then selling them a few at a time. 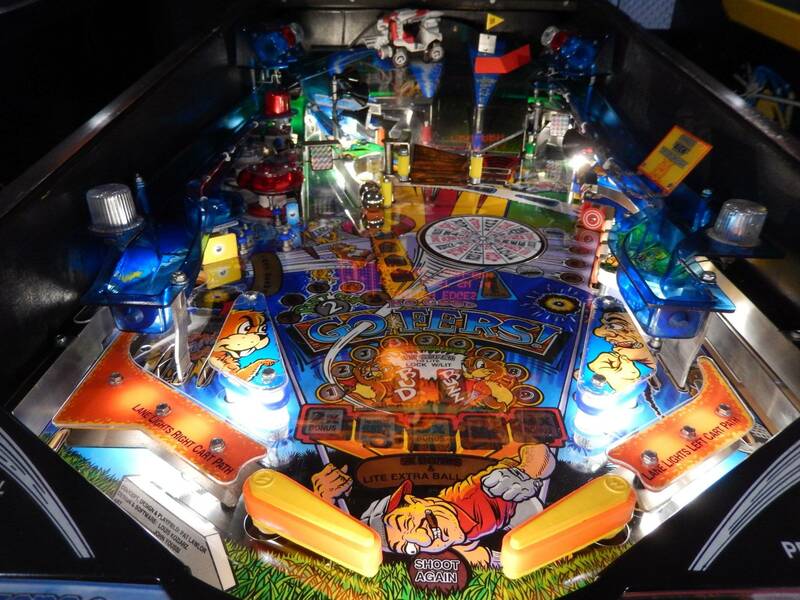 So the difficult parts like Bud & Buzz will probably only be made by Planetary Pinball as they likely have the original molds, but still the number of gofers needed to be made is limited. 458 Pinsiders have NGG listed as owned, so that tells you how many gofers might be needed. This is nothing against you, but a consumer that has a machine that doesn't have gofers or big shots or whatever part isn't concerned about how much it costs the business to make it. They just know their 2000+ dollar machine is not very useful without the parts. Assuming that you could make Bud &amp; Buzz without needing any permissions, which in itself if questionable, you have to be able to upfront the costs of making the mold and buying the parts and warehousing them...then selling them a few at a time. 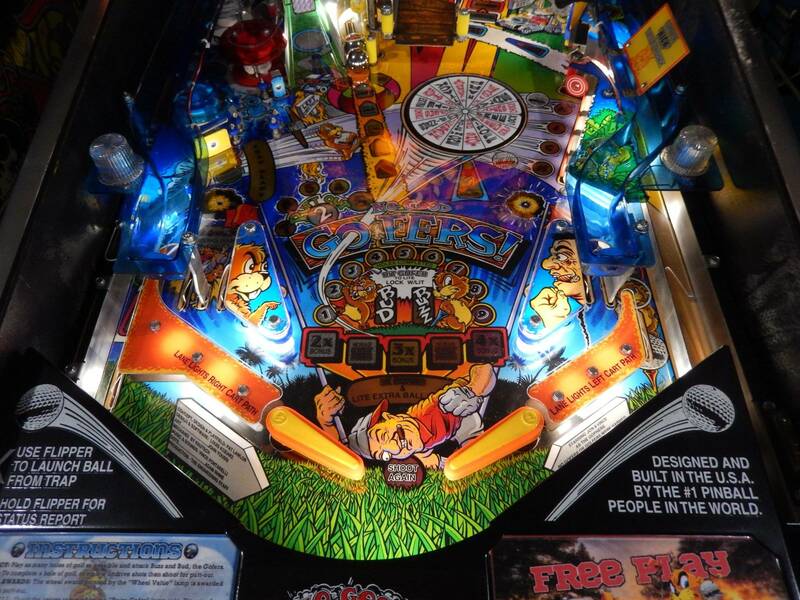 So the difficult parts like Bud &amp; Buzz will probably only be made by Planetary Pinball as they likely have the original molds, but still the number of gofers needed to be made is limited. 458 Pinsiders have NGG listed as owned, so that tells you how many gofers might be needed. Yes, I understand that completely, I have been in his situation. My post wasn't about anyone or their opinion, but another view as to why some parts are scarce and others available...demand and cost to meet that demand. 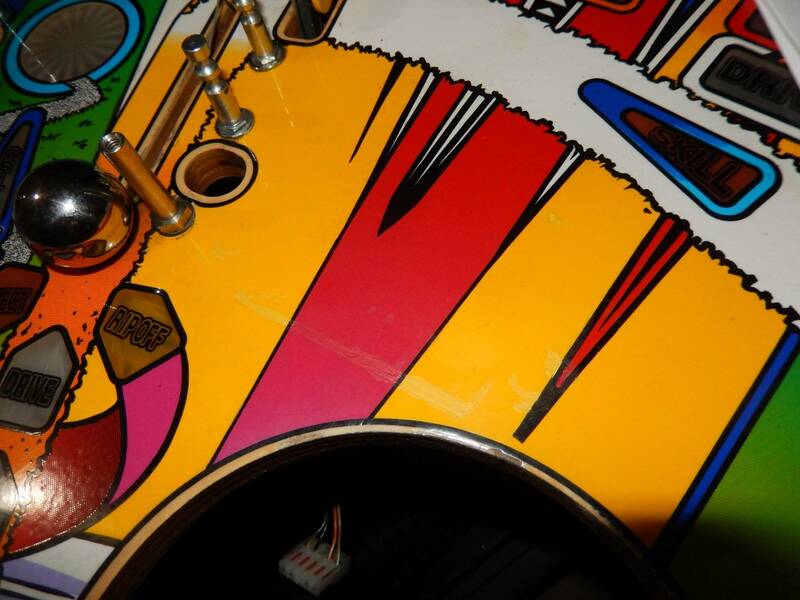 I highly suggest taking them out of the machine and sending them to Modfather for custom repaint. PPS may remake them in the future and going to their website and asking them about future availability (of any unavailable Williams/Bally part) will at least let them know what people want. I have been told that PPS will be remaking Bud & Buzz "soon"...not sure what timeframe that is, but at least the news is good. Joining the club today! Super pumped. My first Solid State game and couldnt be happier. 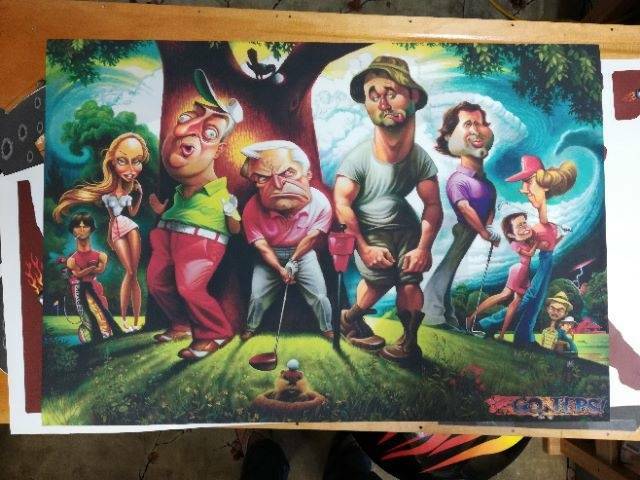 As a big time golfer this is by far the best pin to purchase! I got it at a pretty fair price considering the market is a little high now a days in my area. I am planning to clean it up/wax it this weekend. Ordered a new spin sticker already. 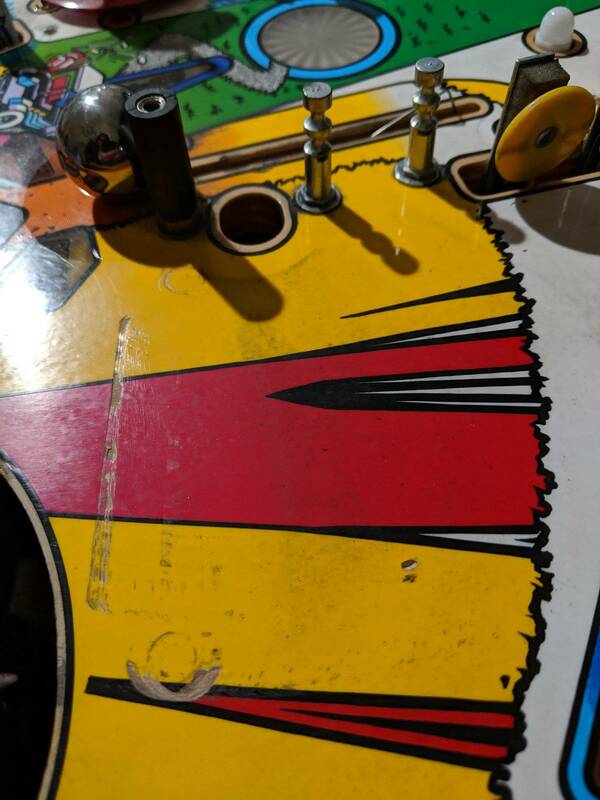 Playfield has some damage under the slam ramp but what ever I buy pins to play not to shine. Ill get some updated pics after I shop it. Schamattack awesome grab, I saw that on CL and almost thought of buying a second. If you need to do any comparison or need any pics let me know I'm right down the road in Oak Creek. Hey guys quick question. My game didnt come with a manual so bare with me. 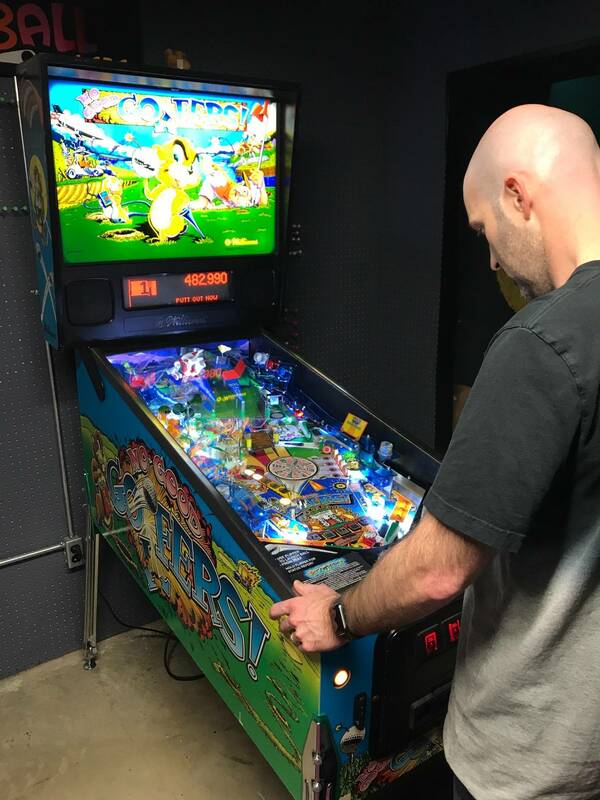 When I power it up everything seems fine, game starts and flippers/spin motor work fine. When I open the door it says coin door open/check J45 and J46 pop bumpers, spin motor bad, wires reversed on spin motor. Any insight on this? Everything seems to be fine when I play/door closed. There is a PDF of the manual on ipdb. There’s another one at my house in Waterford. 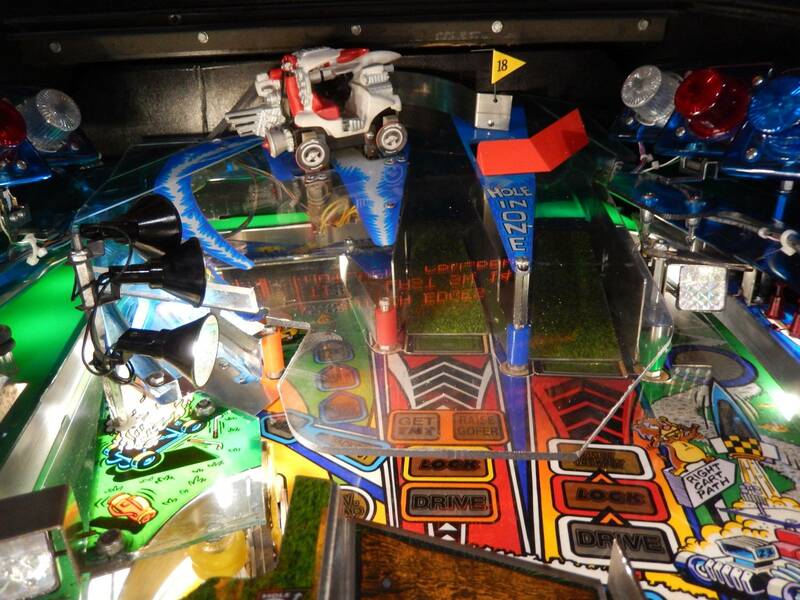 Got the playfield and ramps all cleaned up. Resolved the spin motor, wires were in fact backwards?? Lol. Still getting the 45 rgt popper and 46 right popper error. Everything else is playing great though. Took all the light assemblies out on the bottom side and cleaned them. Super super dirty. Question for you guys and gals, Buds teeth are pretty worn from ball impact, can I paint his teeth with a white paint pen and then put some polyurethane on over or will the balls just knock the paint right off? Still getting the 45 rgt popper and 46 right popper error. Look at the manual, page 2-41 item 16. This is the right popper. Look at page 2-48 items 45 & 46. These are the 2 optos that are in the right popper. 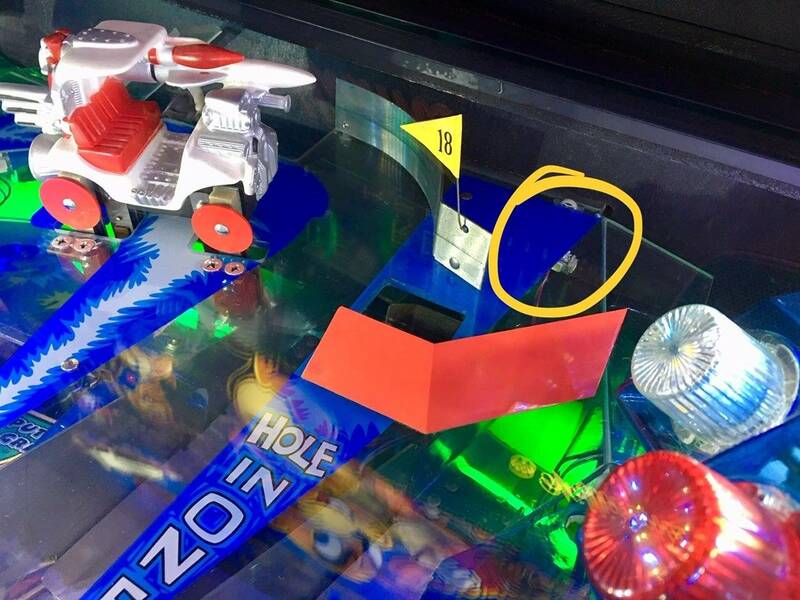 When you go to switch test, put you finger or a piece of paper or other item to break the opto beam. Does that show up as a switch activation? Also, are the wires still attached to the optos? Is the connector that is attached to the opto wiring (a bit downstream) connected? 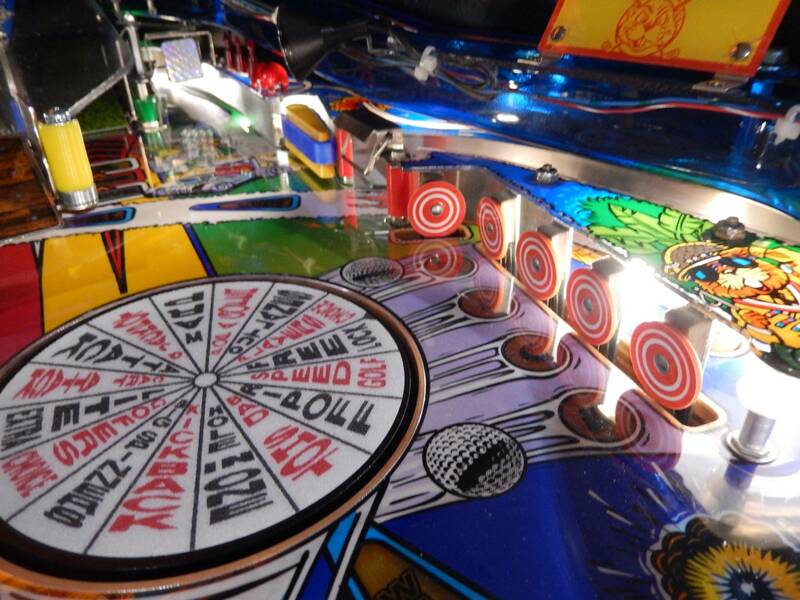 You'll have to take out all the balls and raise the playfield straight up to be able to access the right popper area. When I was cleaning the lights yesterday I checked for any loose wires in the area and could not see anything obvious. 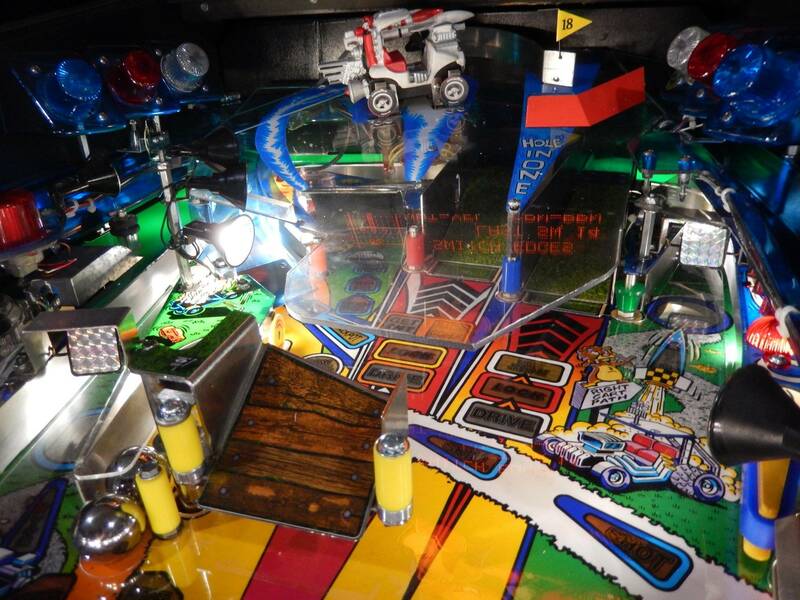 From the top side I can not get my finger/q tip to the area of the opto's because they appear to be under the top playfield and down behind the second gofer? I can not confirm this but by the picture its somewhere back in that area. 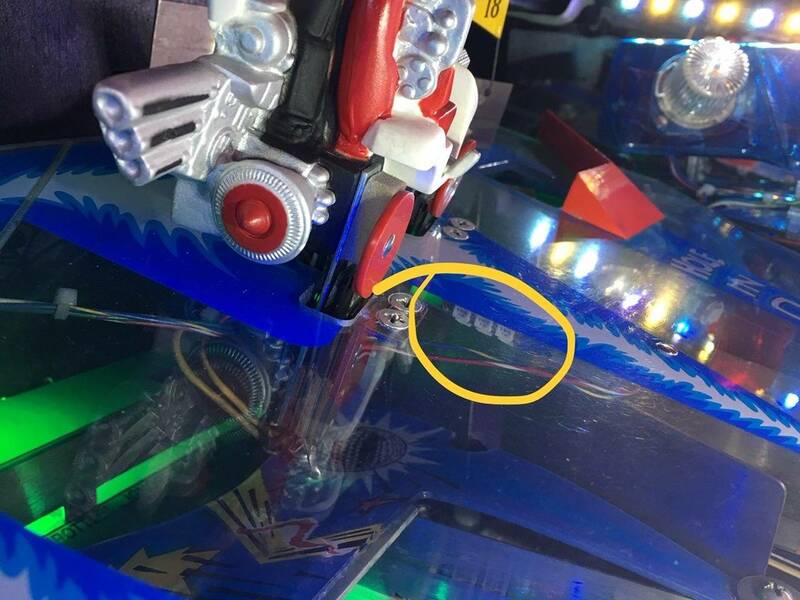 If I go below the play-field can I access the switches? 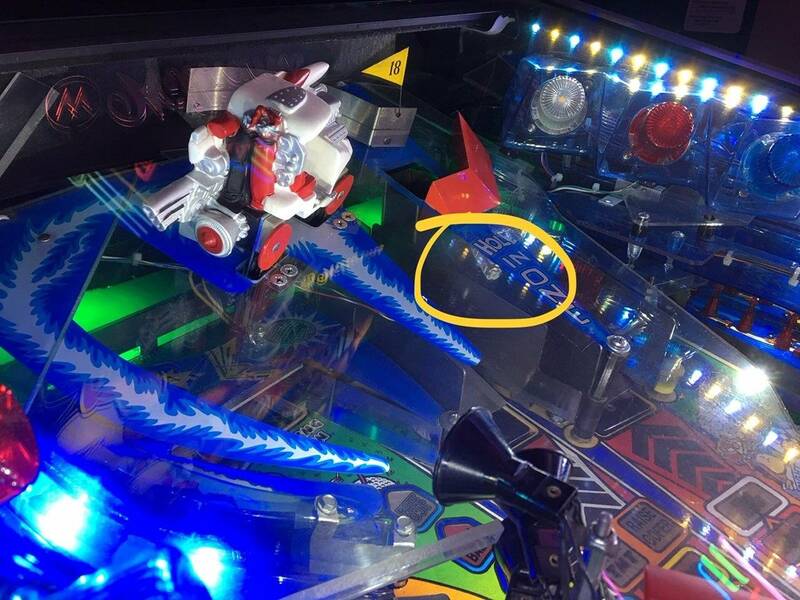 If I go below the play-field can I access the switches? 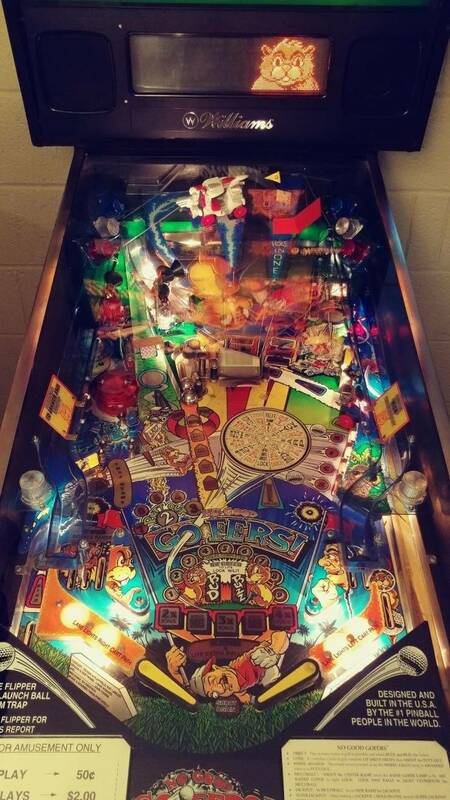 Yes, you need to take out the balls and raise the playfield, resting it on the backbox to access the right popper optos, wiring and connector. Ok guys... Got a weird one. When i hit the left cart ramp/spinner the game kicks another ball out... Does it every time i hit it... Feel like I'm playing multi ball constantly. 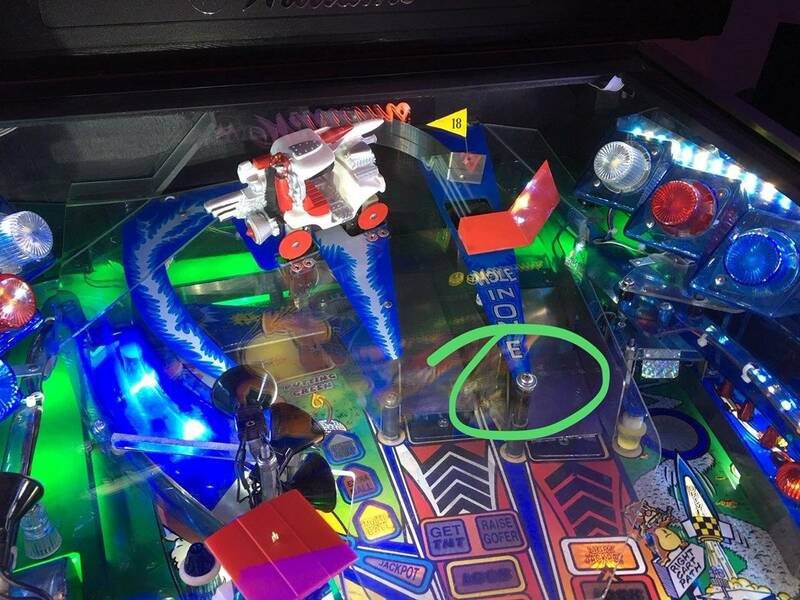 when i got the game the switch was unplugged for the spinner. With it plugged in it does this. Super confused. No errors unless its un plugged. Anyone experience this? In switch test, when you spin the spinner does it show up as switch 61 left spinner? In switch test, when I flip switch manually it say trought eject 31 then left spinner 61 every time. So I am doing a comparison to the right spinner and can see the wires are not oriented the same way.... going to swap them on the switch and see how it responds. Sure as s***!!!! Reversed the wires to match the right spinner and now when I test it just left spinner 61 activates!!! No more Trought eject. This is normal now correct? Yes...play a game as see what happens. Fixed the issue. No more multi ball every time i hit the golf cart path . Back to just the 45 and 46 right popper issue. Should get a chance tomorrow to look more into it. Will post results with what i find. I dunno...should I keep the new one or go back to the old one? Looks great, just got my replacement in the mail yesterday. So finally got around to doing this today. I found the switches and they work. Errors are gone after activating them. So this now has me curious. Is it that uncommon to activate the right gofer ball stealing? I have gotten the left gofer to do it often but never the right one. 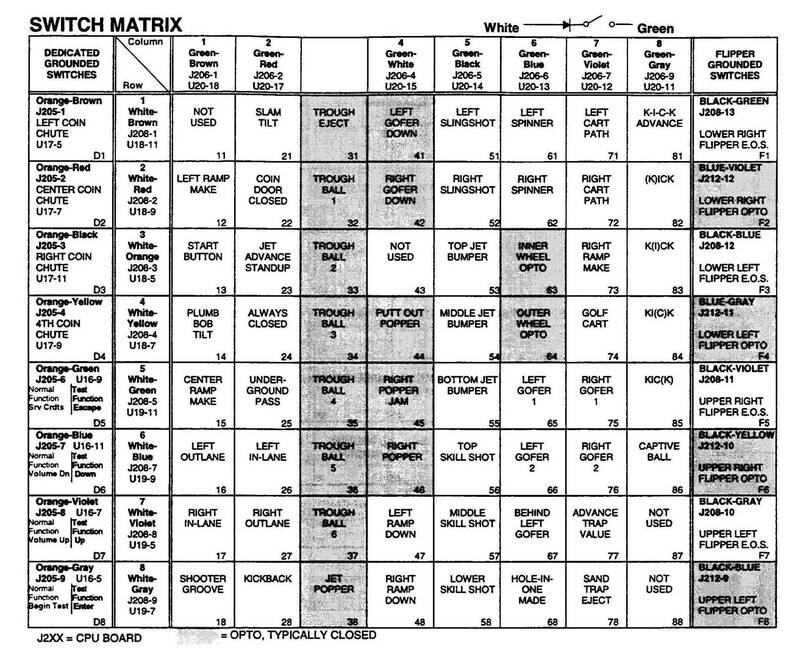 I am assuming the switches were giving errors because the game played 30 rounds without activating the switches. At least thats what I am understanding from the manual. Is it that uncommon to activate the right gofer ball stealing? I think exactly what it takes to steal a ball depends on your settings. So with the glass off, start a game and with the ball and your hand do what you need to do to get the left gofer to steal the ball. Then do the same to the right gofer and see if that works. Well I can tell you after firing it up today the 45 RGT Right Popper error is present again. No 46 though. Hrmm. So the switch works but triggers a failure after a power cycle. Maby opto is in fact bad? Clean all 4 of the opto halves with a q tip and rubbing alcohol. They may just be dirty. Thanks for the help Robert! Well I found my problem. The opto's are good. After cleaning error once again went away but came back. I found the Lift ramp catch bracket is gone along with the spring. 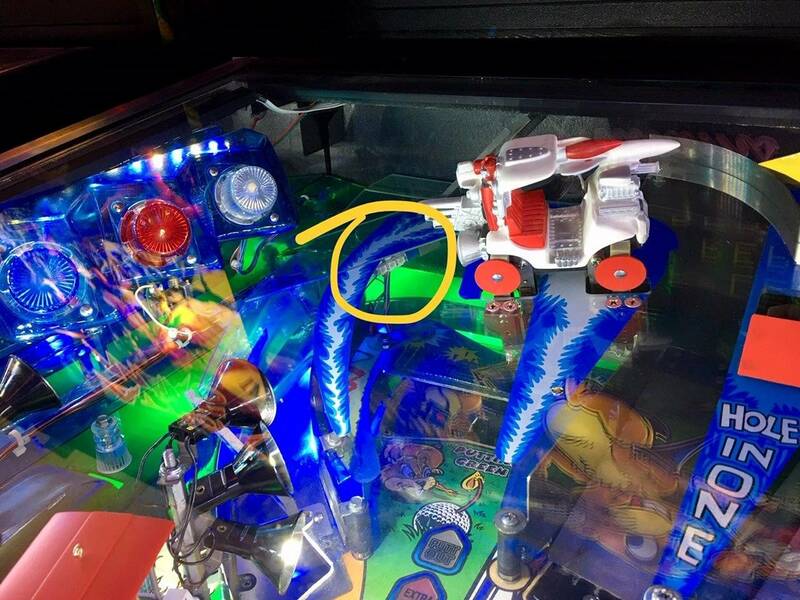 Makes sense considering lock lights up but the ramp never stays up :/ Unfortunately No one has this part in stock ugh. 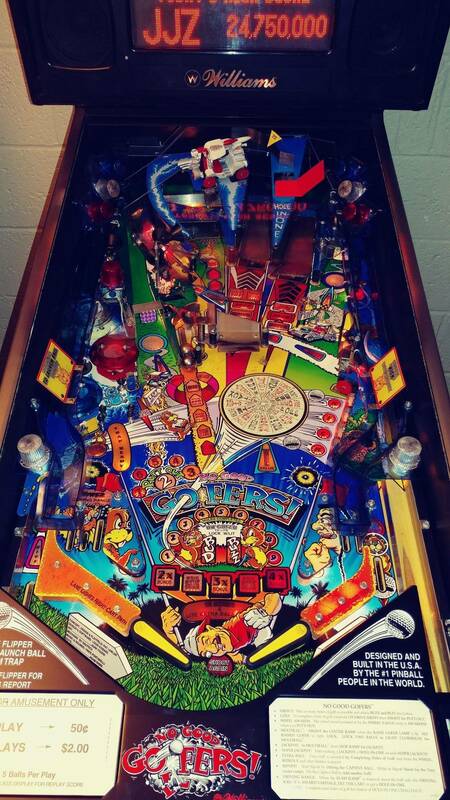 I found pinballspareparts has it but its going to cost more to just ship is from australia ugh. Is this the part you need? I found the Lift ramp catch bracket is gone along with the spring. Well, good find, I didn't think of that being the issue. You may be able to get a new spring at the hardware store, if not Marco is probably the cheapest with shipping...which is 6x the price of the part. Maybe the spring is in the bottom of the cabinet, or stuck to the speaker magnet. If you have to buy the spring, probably should order a few other things so it doesn't hurt so much. 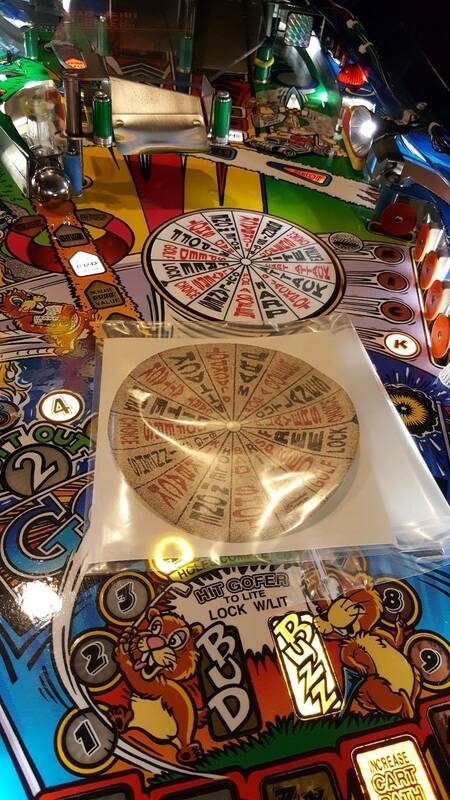 Bay Area amusements carries some NGG parts too..